The paper gods collected on this Web site were donated by Anne S. Goodrich (July 1895–April 2005) to the C. V. Starr East Asian Library in 1991, approximately sixty years after she purchased them. At the time of the purchases, she was working as a missionary in what was then called Peking. She had been born in China, and she returned after receiving her education in the United States, an education that included graduate work at Columbia University's Teachers College. Also working in China as a missionary was her future husband, L. Carrington Goodrich, who eventually became chairman of the growing young Department of Chinese at Columbia University, which eventually became the Department of East Asian Languages and Cultures. Together and separately the two donated many interesting artifacts from their years in China. It is a mark of Anne Goodrich's intellectual curiosity that the folk religion of the people she worked among so intrigued her. Her interest in the paper gods she saw in the homes of acquaintances led her to learn all she could of the local folk religions. 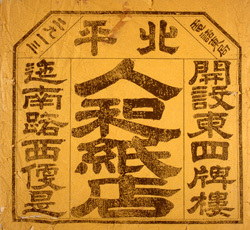 She began by purchasing everything that was in the store called Ren he zhi dian 人和紙店 (Unity Among Men Paper Shop). She spent much of her long life answering for herself many of the questions raised by Chinese culture, and as a result she published a three-volume study: The Peking Temple of the Eastern Peak: The Tung-yüeh Miao in Peking and its Lore (Monumenta Serica, 1964); Chinese Hells: The Peking Temple of Eighteen Hells and Chinese Conceptions of Hell (Monumenta Serica, 1981); and Peking Paper Gods: A Look at Home Worship (Monumenta Serica, 1991). When she finished her last book, she donated to the Library the primary resources she had studied in order to write it. These are the paper gods featured on this Web site. However, she was well aware that hers was not the last word, and that many questions remained. Her donation was intended to provide other scholars she viewed as more accomplished than herself with the primary resources to delve into this important aspect of lives as they were lived in early twentieth-century China. This Web site is offered in the hope that scholars with similar curiosity about these images and the worldview they represent will continue the study and deepen our understanding about their significance. Questions and suggestions concerning the site are welcome. Please send e-mail to starr@libraries.cul.columbia.edu.